Buy Table Skirts Online! These Tablecloths ship fast! 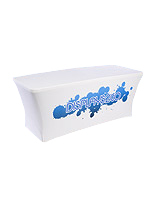 White table cover is completely customizable. 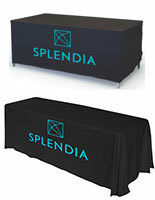 Stretchable full color fabric fits snugly on any standard 8ft tables. 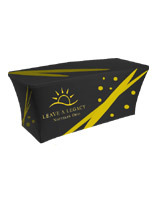 Bright and eye-catching printing perfect for use in any special events. Open back design allowing staff members to sit comfortably behind the table. 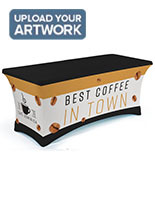 Logos, taglines and business names are usually printed onto the table skirts utilizing a dye-sublimation process which bonds the image to the fabric textiles for brilliant colorings and fine details. The brilliant, full coverage printing on the fabric will certainly draw the curiosity of event customers. 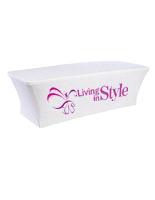 Make your message stand out in the course of any occasion or big event utilizing these table skirts. These affordable table skirts for sale, also recognized as fitted counter top linens, feature an open back design, permitting you to conceal any extra supplies below the counter top. An added bonus is the hamper-free space for staff members to sit without the inconvenience of a cloth skirting getting in the way. 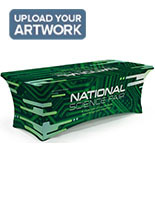 These table skirts also are available in a 6 ft. dimension, and also with a front dye-sub printing option as well. These easy to maintain tablecloths are perfect for every function! Table skirts are not difficult to care for, wrinkle-tolerant, washable and flame retardant. These event linens, table skirts are the easiest way to dress up a display. Manufactured from 100% Poly-flex fabric, these table skirts are engineered to snugly match any common dimension 8-foot counter top. A majority of these table skirts are constructed to stretch on the top and sides of the table with not pins or snaps required. These counter top linens, table skirts stretch to safely fit over the counter top and under the counter top feet. These table skirts, also recognized as counter top linens, have an open back design, permitting you to conceal any accessories below the counter top as well as provide a space for staff members to sit.